If July 20, 1969 taught us anything, it’s the if you are going to go off-road (like, really off road) you gotta have a good pair of boots. It is an integral part of the equation. 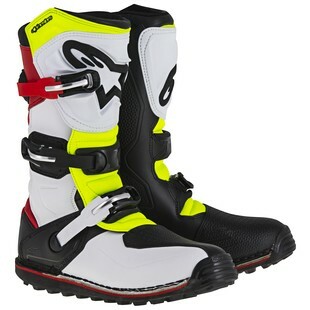 With the Alpinestars Tech-T Boots, motorcycle trials riders get precisely that. Riding trials bikes takes something very different than most other two-wheeled skillsets, and as such, so too do trials-specific motorcycle boots offer something different. With the Tech-T Boots, Alpinestars has made a high-end option available to riders in search of reliability, comfort, durability, and flat-out defenses against the rigors of riding trials bikes. From the full-grain leather and microfiber upper, to the double density TPU ankle protector disks that have been layered with poly-foam padding, to the ergonomically contoured shin plates, to the soft poly-foam reinforcements for comfort and impact absorption -- the Astars Tech-T Boots are as robust in protective features as they are hungry to devour every trials obstacle in their path. Additional features of the Tech-T Trials Boots include extended front and rear accordion stretch zones, 3D mesh textile inner lining, and industry-leading buckle functionality for fitment and minimized frustrations. If you are going to lead the charge on paths that have never been traversed before, you might as well do so in boots that are not only going to help you get there, but will also leave a memorable set of footprints at the finish.